Paul begins the letter according to the custom of writing letters at that time; the name of the person who wrote the letter and the persons to whom it was written are both inserted. It is an epistle from Paul, the apostle of the Gentiles, to the church of Corinth, which he himself had planted. Paul is the author, or rather the writer of the following epistle; in point of fact, the Holy Ghost was the author and divine Dictator of it, which has never been doubted, except by those who refuse to believe. He is called by his Roman name, Paul, though his Jewish name was Saul; he was a Jew by birth, but he was born in a Roman city. He was allowed two names, the one Jewish, the other Gentile. He went by Saul when among the Jews, and by Paul when he was with the Gentiles: He was also called Paul when he was in his office; fulfilling the responsibilities of "an apostle of Jesus Christ." He was immediately called, and sent forth by Christ; received the Gospel from him by immediate revelation, and a commission to preach it. His high office was confirmed by signs and wonders, and mighty deeds; by the extraordinary gifts of the Holy Ghost conferred on him, and on others under his ministry; and by the well-known success which came to him by preaching the Gospel. He calls himself an apostle and he holds the office, but some in this church express doubts (vs.9.1, 22), through the insinuations of the false apostles (2 Co 10.10? ), about his qualifications; but this was not a mere name given him by men, but was an office he was "called" to by Christ; he did not rush into it, or assume it by his own authority, but he had a divine commission and was empowered to perform it. Then it follows, that if Paul is an apostle, then he must be heard, even though he sometimes sharply reprehends them, bearing in mind that he doesn’t have his own cause in mind, but is a messenger that brings the commandments of Christ. The words "to be” were added by the translators, but they are unnecessary and even cloud the meaning. Paul was stating what he was, not what he intended to be. As in most of his writings, Paul stressed his divine commission as an apostle, thus invoking the authority needed for dealing with the errors prevalent in Corinth. Paul has been called by God, that is, set apart by the will of God. Now, two things are required of anyone that would be listened to in the Church, and would occupy the place of a teacher; first, he must be called by God to that office, and second, he must faithfully discharge its duties. Paul here lays claim to both. For the name, Apostle, implies that the individual conscientiously acts the part of an ambassador for Christ, and proclaims the pure doctrine of the gospel. But, no one ought to assume this honor to himself, unless he has been called to it. Paul's call to the office of an Apostle had nothing to do with personal merit; he says instead that he is "an apostle by the will of God," and this is what constitutes the ground of the authority he claims in the Corinthian Church (compare to Galatians 1:14). It was both by the secret will and purpose of God that he was a chosen vessel, to bear the name of Christ among the Gentiles, (Acts 9:156) ; and by the revealed will of God, designated by the Spirit of God, who said, "separate me Saul and Barnabas, for the work whereunto I have called them", ( Acts 13:2), and this shows, that it was due purely to the free grace and sovereign will and pleasure of God, that he was made an apostle of Christ. And assuredly as a call to salvation is of grace, so also a call to the office of apostle is of grace, as Christ teaches in these words: "Ye have not chosen me, but I have chosen you," (John 15:167). Paul, if left to his own will would never have been an apostle (Romans 9:168). It’s clear that He sees his call by God as a reason for humility on his own part (1Corinthians 15:105). the Judaizers to recognize Paul as equal to the twelve made him more resolved than ever to claim his position. It was proper at any time, but necessary at this time, to assert his character, and magnify his office, given that false teachers made it a point to belittle him, and their deluded followers were likely to set them up in competition with Paul. It was not Paul’s pride, but faithfulness to his commission, that made him stubbornly maintain his apostolic character and authority. This man is probably the same person mentioned Acts 18:179. 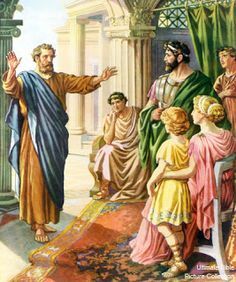 In Acts 18:12-1710; an account is given of an attempt made by the Jews at Corinth to induce the Roman deputy to inflict punishment upon Paul for the offense of preaching Christianity. The attempt not only failed, but it produced a reaction in Paul's favor, so strong that the populace arose and took swift vengeance upon those who had made the attempt, including one named Sosthenes, the chief ruler of the Synagogue at Corinth, whom they appear to have regarded as the leader of the hostility against Paul. He received a public beating, but He must have had an amazing conversion, because soon after it seems that this Sosthenes became a Christian, and was now the apostle's friend and companion. His prominent position as ruler of the synagogue at Corinth, and the personal influence which would naturally be connected with it, were very probably the reason why his name was joined with that of the apostle in this communication. Apollos, Priscilla, and Aquila, all well known to the church, were at Ephesus with Paul (see 1 Corinthians 16:1212; 1 Corinthians 16:1913), but Sosthenes is chosen to appear with him in the salutation. However he is in no sense a co-author of the Epistle, but merely an associate of Paul, and a brother whom Paul shared Christ with and participated in his conversion. Apparently, he was the amanuensis (the person who did the actual writing), and Paul dictated while under the influence of the Holy Ghost. Paul wrote only the salutation and lovingly included his helper. The emphatic first person singular pronoun “I” in 1 Cor. 1:411 denies that Sosthenes had anything to do with the content of the epistle. Sosthenes is not equal in office with the apostle, but as a brother in Christ, and very probably a ministering brother, and a companion of his, and a person well known and respected by the Corinthians, he chose to list his name in this letter of reprimand, to show their agreement in doctrine and discipline, and in the advice given to them. This epistle is written to the saints at Corinth; who are described by the phrase "the church of God", a particular church congregation. I believe a congregation as it pertains to religion could be defined as “a number of individuals gathered out of the world, and joined together in holy fellowship, carrying on the worship of God together, and walking in all the commandments and ordinances of the Lord; a people of high character who are called The Church (the building and the denomination are not the church), which is the pillar and ground of truth. In this particular church at Corinth, it will soon be seen that some of the people have committed indiscretions; and there are false teachers who teach false doctrine, and there is confusion and some have split from the church. The church location is mentioned; it is the church which is at Corinth, the "metropolis" of Achaia; a very large and wealthy city, a place of great trade and commerce, and famous both for its wealth and wisdom. But, it is not famous for anything like this; that there was a church of Christ in it. This Church was planted by the apostle himself about A. D. 52. Paul addressed his letter to the church which is at Corinth and to the church of God. He calls it that even though it has many scars. It is a dangerous temptation to think there is no church where there is not apparent perfect purity. Anyone that thinks that way will eventually separate from all others and think of himself as the only holy man in the world, or establish a sect of some kind along with a few hypocrites. It was enough for Paul in recognizing the Corinthians as a church, that he saw among them evangelical doctrine, baptism, and the Lord's Supper. It was the Church of God, not of this or of that favorite leader. The church did not belong to the Corinthians but to God, unto whom they were set apart (sanctified) to serve God by reason of the fact that they were "in Christ.” This designation, Unto the church of God, appears oftener than any other in the New Testament. Friends, there is no perfect church; did you ever hear this snicker; “I would never join a church that would have me as a member.” There are a lot of people who believe they are to “Bad” to go to church.